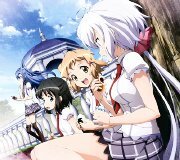 This CD contains the ending song to the TV anime Senki Zesshou Symphogear G (戦姫絶唱シンフォギア G). Songs by Takagaki Ayahi (高垣彩陽). There are three different versions of this CD.